Tommy Katsiyiannis fends off a defender. The sophomore midfielder provided the assist for Northwestern’s goal. 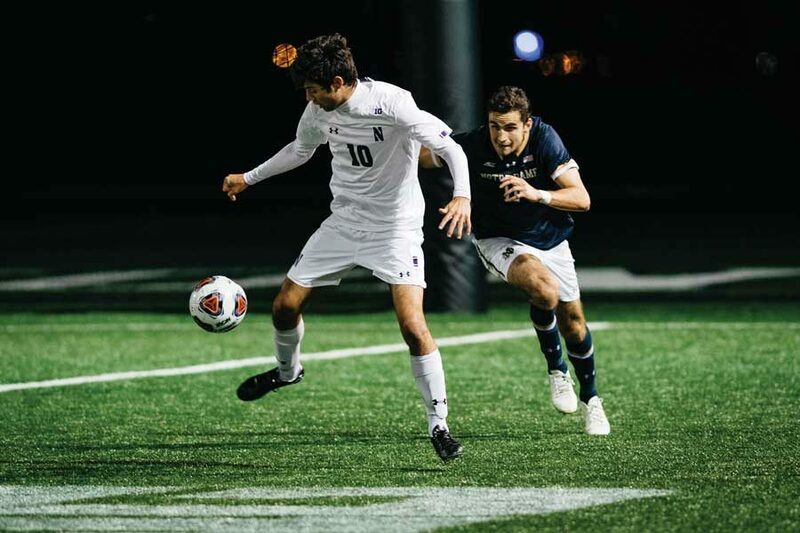 When sophomore defender Garrett Opperman’s header floated past Drew Nuelle and hit the bottom netting of the south-end goal less than seven minutes into Tuesday’s 1-1 draw with DePaul, it looked as if Northwestern’s fortunes may have been changing. The goal — the Wildcats’ 11th of the 2018 campaign — snapped an almost 332-minute goalless streak that stretched back 13 days to NU’s loss against then-No. 2 Indiana. And while they had not scored against Penn State on Saturday, the Cats had attempted a season-high 17 shots, seven of them on frame. For a team that entered Tuesday’s contest third-to-last in the country in shots per game and fourth-to-last in shots on target per game, the early lead gave NU the chance to procure an early advantage. But the Cats could not use Opperman’s second goal of the season to take control of the contest. In the final 38 minutes of the first half, the Blue Demons fired 10 shots — the most the team has attempted in a first half this year — and earned four corners as they equalized the match 31 minutes in when DePaul’s Jack Richards headed in a cross from Harry Hilling. In the second half, NU attacked with much more energy. The Cats took 10 shots of their own compared to DePaul’s three, won five corners and earned a bevy of chances, including a breakaway opportunity from junior forward Ty Seager in the 75th minute. In overtime, opportunities presented themselves, but there were not as many as in the second half. NU did earn a corner but could not achieve a shot in the first extra period. The Cats played some dangerous balls in the second extra 10 minutes, with Mattias Tomasino having a header saved off the line, but could not score again. The failure to put the ball in the back of the net has plagued NU all season. “While we were lucky to get out of the first half 1-1, we were a little unlucky to walk away from the game with draw,” Lenahan said. Part of it can be attributed to injuries. Freshman forward Jose Del Valle was injured less than 25 minutes into the first game of the season and has played in only six games this season. Del Valle played 85 minutes against the Nittany Lions on Saturday, but did not see the field Tuesday. In addition, Seager left the game with under 14 minutes left in the second half with an injury. The Cats are also playing some stout defenses. NU has attempted fewer than five shots in five games and four of them have been against teams ranked in the top-36 in the country in goals against average. But the Cats are not firing shots past weaker defenses either. NU has only 103 shots on the season compared to 193 for opponents, and many times, the Cats are significantly outshot. NU attempted more shots than its opponents four times this season, and three of those games have resulted in ties. The Cats have attempted more corners only twice. Goals and corners do not fully encompass the success and failure of an offense — there is a lot that these basic stats do not encompass. But in the seven games since its last victory against Missouri – Kansas City on September 9, NU has taken 57 shots and scored just three times for a scoring rate of 0.43 goals per game, which would be the worst in the country. After accumulating double-digit shots only once for the first 11 games, the Cats have taken 17 in each of its last two games. NU’s offense is starting to take shots, but now it has to start converting them.